Create family memories in our clean and remodeled cottage that is home to one of Silver Lakes best beach front properties. The waters of Silver Lake are very clean and warm for your enjoyment. This cottage features 2 bedrooms and 1 bath. The parents bedroom offers a queen size bed, the kids room is set up with 3 twin beds. A full size sofa sleeper and futon are also available. All bed and bath linens are provided. The kitchen is fully furnished and includes a microwave, dishwasher, full size refrigerator, stove and oven. The lower level features a sun room to enjoy your morning coffee or evening cocktail. Both levels have window air conditioners. Outdoor amenities include a sandy, private beach, private dock for your boat, swimming raft, paddle boat, row boat, and 2 kayaks. There are 2 decks overlooking the lake and includes a gas grill and picnic tables. A fire-pit and chairs on the beach are for memorable campfires, firewood included. A public boat launch is just 2 miles away, as are 2 wonderful parks and kids playground. We really enjoyed our stay here! The cottage owners are very friendly, flexible, and accommodating. Everything we needed was provided, and many extra items included (board games, movies, outdoor activities) and the home was very clean! The property had its own beach area with a nice area for a camp fire set up wth chairs. We were even able to use the paddle boat, paddle board, and kayaks! The lake was beautiful, and had wonderful sunset views every evening. We couldn’t have asked for a better place to stay! You will love it here. My wife and I spent 4 wonderful days at this great little retreat on Silver Lake. It was just what we needed. Reading, fishing, and yes even swimming in the middle of September... the weather was that great! The cottage is very charming and so well kept. It has everything you need. A fully stocked kitchen, comfortable bed, lounge chairs on the beach, kayaks and float toys to use all made this a very enjoyable stay. Dave & Ellen were great hosts and went out of there way to make us feel welcomed. Hope we can visit again some day. Enjoyable week...our stay is always a great experience!!! Absolutely loved every minute of our vacation! The property is immaculate and fit our every need! We had the best vacation! This house is perfect! It has everything you could possibly need to make your stay comfortable and fun! The owners are truly amazing and provide so much help and information. The lake and beach area is beautiful and we loved having the kayaks, paddle boat, paddle board, diving dock, and all of the other fun toys! It’s a gorgeous property with the nicest owners. And the overall location is excellent for all activities around Traverse City and the Sleeping Bear Dunes! We will be back! Our children are in love with this place as well! I cherish the memories we made and can’t wait to make more in the future! 3 years in a row and still going!!! This has been our third year renting David and Ellen’s cottage and we always love it. They are fantastic hosts and take care of their guests and the property. After three years they feel like part of our family as my kids look forward to going to going to “Mrs. Ellen and Mr. David’s” house every year and talk about it in the months approaching our annual family vacation up north. They have watched our kids grow so much in the last three years and are always so thoughtful. The home is always clean and well maI gained and if an issue comes up they both work as quickly as possible to resolve it. 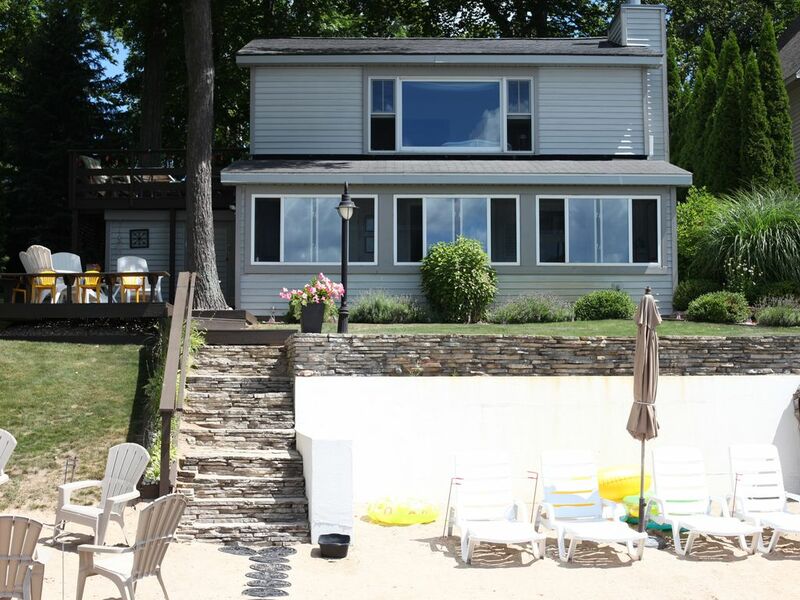 The location of the home is perfect with sunset views on the lake to a short drive to downtown Traverse city. Everything you need is close by and extremely confident when you have little ones like we do. I have rented vacation homes for many years and have never been more satisfied with my experience than I have with David and Ellen. They are truly wonderful people with a great property that focus on ensuring their guests’ experience is one that you will never forget and always cherish. My wife and I had a great stay. The house was clean, neat, and as advertised. The owners were very pleasant and accommodating. We would highly recommend this place. This property is located just 4 miles from the shopping and fun that Traverse City has to offer. Great location to take in the National Cherry Festival or Traverse City Film Festival. Interlochen Center for the Arts is just 10 minutes away. The Sleeping Bear Dunes National Lakeshore Park is 30 minutes away. Walk to see our baseball team, the Traverse City Beach Bums, play a fun game of minor league baseball.